The white grape variety is a new breed between Riesling x Madeleine Royale, Some synonyms point to the long misunderstood parenting Riesling x Sylvaner. Within the EU, those names are no longer allowed, such as B. Riesling-Sylvaner refer to it. The most important are Müller-Thurgau vine, Müller Thurgau white ( Germany ); Müller-Thurgau Blanc ( France ); Uva di Lauria ( Italy ); Riesling Silvaner, Riesling x Silvaner, Riesling Sylvaner ( New Zealand. Switzerland ); Rivaner ( Austria. Luxembourg ), Rizlingszilvani ( Hungary ), Rizvanac, Rizvanac Bijeli ( Croatia ); Rizanec, Rizvanec ( Slovenia ); Muller Thurgau White ( United States ). Due to its properties, it is a popular crossing partner of new breeds. That's among other things Albalonga. Arnsburger. Bacchus. Diana (1), Faberrebe. Floriánka. Fontanara. Gloria. Goldriesling (2) Grando. good Borner. Helios (1), Hildegardis grape. chancellor. Marie Steiner. striking. Medea. Milia. Montagna. Muscabona. Muscat Bleu. Optima. Ortega. Pálava. pearl. Rabaner. Regner. Reichensteiner. Schantlrebe. Septimer. Tamara. Thekla. 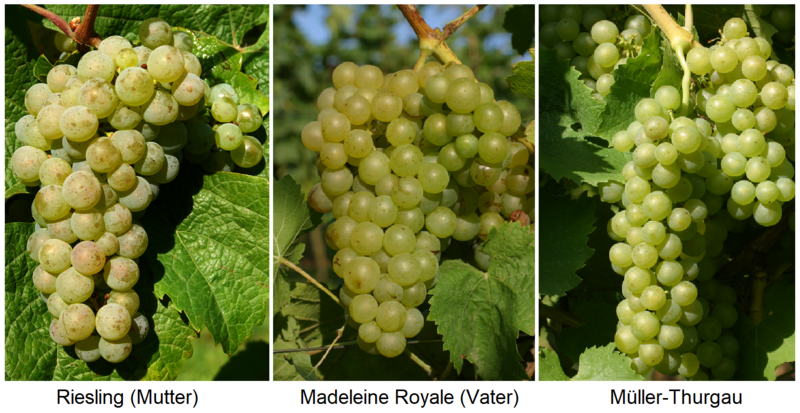 Thurling and Würzer, Two mutations are foundling (ripening earlier) and Red Muller Thurgau (Beer color). The determination of the parenting dragged on for decades, until in 1996 the already repeatedly doubted paternity of the Silvaner proved wrong. Breeder was the Swiss Dr. Hermann Müller-Thurgau (1850-1927) from Tägerwilen in the canton of Thurgau. He was in the period 1867-1890 at the Royal Institute of Fruit and Viticulture in Geisenheim (Rheingau) active. In the issue no. 26 of the magazine "Der Weinbau" of June 24, 1882, he formulated the breeding goal of the crossing experiments: "How important could be, for example, for some wine-growing regions a grape variety, with the delicious properties of Riesling grapes, the safe and earlier Maturing period of the Sylvaners united. " Until 1890, the pre-examination of the new varieties from the breeding of the varieties Riesling x Silvaner still took place in Geisenheim. In 1891, Hermann Müller-Thurgau relocated to his homeland to found and build the Swiss Federal Institution according to Geisenheim's model Wädenswil in the canton of Zurich. In the same year he had 150 of his pre-tested in Geisenheim seedlings come to Wädenswil. There selected Heinrich Schellenberg (1868-1967) the best seedling No. 58 and increased it in 1897 under the name "Riesling x Silvaner 1". The Bavarian Hofrat August Dern (1858-1930), a former colleague of Müller-Thurgau in Geisenheim, brought 100 vines of this new breed in 1913 back to Germany and named it in honor of the breeder "Müller-Thurgau-Vine" (which Müller-Thurgau rejected by the way, he always called her after the alleged parents). Müller-Thurgau himself was skeptical of the parenting Riesling x Silvaner at an early stage and expressed his concerns in a letter to August Dern, which he accused of having "taken the wrong grape variety from Geisenheim" with him. The thesis that the variety is not a Riesling x Silvaner hybrid was strengthened early on by the fact that not one of the later Geisenheim, Würzburg and Alzeyer Riesling x Silvaner crosses corresponds to the character of "Müller-Thurgau" (one of the Geisenheimers Attempts was Multaner ). As early as 1950, Dr. Heinrich Birk (1898-1973) for the first time on these connections. Also Dr. Hans Breider (1908-2000) came to the conclusion in 1952 that he could find too few features of the supposed pollen donor "Silvaner". Dr. Heinz-Martin Eichelsbacher (1924-2003) came in 1957 in the context of extensive analysis to the conclusion that the variety "Müller-Thurgau" stems from the Formkreis Riesling-Muskateller-Gutedel. For a while, they also adopted a self-hybrid Riesling x Riesling. Finally, in 1996 on Klosterneuburger Weinbauinstitut in Lower Austria by the biologist dr. Ferdinand Regner by means of DNA analysis as a father's strain Admirable de Courtiller (Chasselas de Courtiller) identified. Shortly thereafter, subsequent analyzes at the institute Geilweilerhof (Palatinate Germany) but was verified that it was at the Dr. med. Sprinklers examined and correctly recognized fathers Madeleine Royale (Regner therefore was the first to determine the "right" vine, but it was not correctly named). Both institutes deserve recognition for the clarification of the riddle. Finally, in 2010, the Swiss Dr. Joseph. Vouillamoz the pedigree of the Mueller Thurgau completed (descent of the Madeleine Royale). The early-ripening, high-yielding vine is prone to the true and the false mildew. Botrytis such as Red burner, It prefers cool locations and is therefore very well suited for northern vineyards. The variety yields fruity-fresh, rather acid white wines of light yellow color with a subtle nutmeg, It is quite common as mass support used, but also has quality potential with appropriate yield reduction and Auzsbau. Müller-Thurgau is one of the most successful not only in Germany but worldwide new varieties, which was widely cultivated in many countries from the mid-20th century. In the 1920s and 1930s were in Germany created many pilot plants. But only in 1970 was the classification as recommended variety in all German growing areas. From 1975 to 1995 she was always at the top of the German Rebsortenspiegels and was only then replaced by the Riesling. Since then, the trend is constantly falling, but in 2009 it was still the second most common grape variety with 13,628 hectares of vineyards. Above all, she is in the growing areas Rheinhessen. to bathe. palatinate. Moselle and Franconia common. In Austria it is cultivated in all wine regions on 2,102 hectares with decreasing tendency. There are more stocks in Europe England (43 ha), France. Italy mainly in Trentino Alto Adige, (1,312 ha), Croatia (60 ha), Luxembourg (184 ha), Moldova (173 ha), Russia (106 ha), Switzerland (493 ha), Slovakia (932 ha), Slovenia (144 ha), Spain. Czech Republic (1,572 ha) and Hungary (2,098 ha). There are stocks in overseas Japan (172 ha), Canada (7 ha) and New Zealand (79 ha), as well as in the US states California. Oregon and Washington, The variety occupied in 2010 a total of 22,753 hectares of vineyards with falling trend (ten years earlier, there were 33 587 hectares). It occupies it in the worldwide varieties ranking the rank 37. Sources: Main source in terms of history and descent: Reader's Forum of the magazine "The German Wine Magazine" 1998, No. 22, pages 8-9. Courtesy of Dr. Joachim Schmid , Department of vine breeding and vine refinement, Research Institute Geisenheim , Helmut Becker , 1976, Genetic constitution, breeding and performance of the grape variety Müller-Thurgau, The Wine Science, 31st Jg., 26-37. Heinrich Müller-Thurgau , F. Koblet: Crossing results in vines. Agricultural Yearbook Switzerland 1924, 499-562. Ferdinand Regner , 1996, Releases Klosterneuburg . This page was last modified at 18 December 2018 at 09:12.